The Radio.co Requests feature allows you to provide interactivity on your station. Listeners can choose from a list of tracks you specify to be played on any of your playlists automatically. The more popular a track request is, the sooner it will play! This feature is available on the Broadcaster and Station plans. We recommend completing each setup stage in the order listed in this guide. In your Dashboard, head to Requests > Widgets in the sidebar. Click the green Create Widget button in the upper right and give the widget a pet name. The widget editor will load. 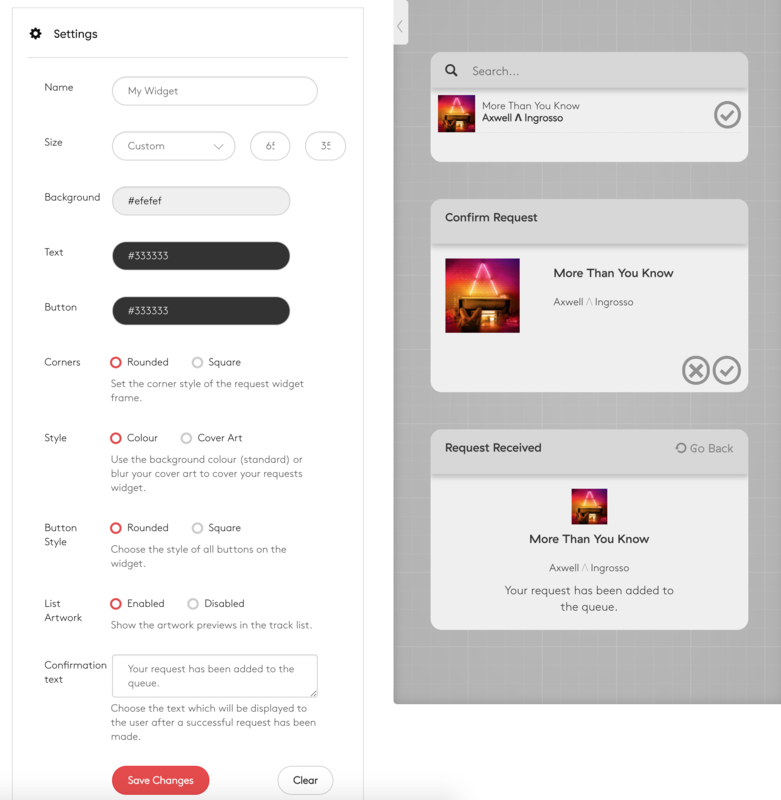 You can see a preview of how your request widget will look on its various sections on the right-hand side. Name - rename your widget. This is a pet name so you can identify it on your Radio.co dashboard. Size - Choose a predefined size or custom from the drop down. List Artwork - Display artwork in your widget's search list. Confirmation Text - Customise the text shown when a listener has requested a track. Click Save Changes at the bottom of the page to save your widget. You can embed the widget on your site using the code shown at the top of the widget editor. Requests can be played out in any of your playlists. To do this you will need to add the special Request Tag to your playlists. You can find this under Tags in your Playlist editor. If there are requests in the queue they will air each time the request tag is reached in the playlist. If the request queue is empty, the request tag will be discarded and the playlist will advance to the next position. Note: If you have no request tags placed in any playlists, requests will not air. Set which tracks you'd like to become available for request, along with listener rules by either clicking the cog icon within Requests or directly in Settings > Advanced. Turn Requests on using the toggle switch. This will also show the options as per the image above. 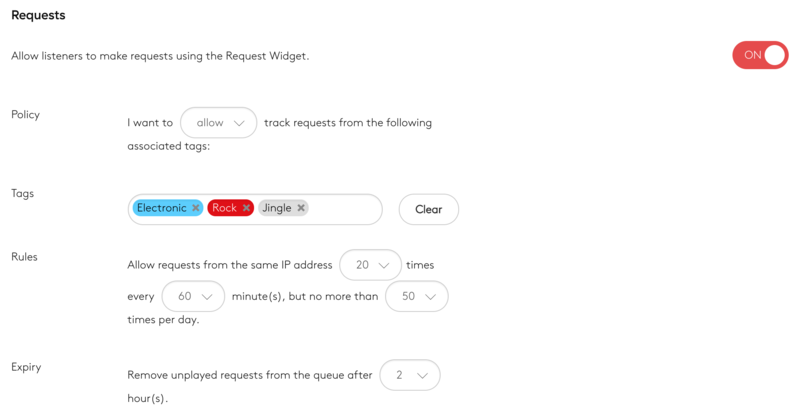 Policy - Choose to either allow or block specific tagged tracks on your request widget. In most use cases this should be set to Allow. Tags - List the tags you wish to apply or block from the request widget list. Rules - Change the number of times a unique listener can request tracks within a specified time period. Expiry - Specify how long a request can remain unplayed before being removed from the queue. Set this to 0 for no expiry. If you wish to disable requests, you can use the toggle switch on this page. When requests are disabled, a message will appear on your widget letting your listeners know. Head to Requests > Manage to load your current requests list. Here you can see how many votes each track has had and remove tracks from the queue. The track at the top of the queue will play first. Note: Requests uses a voting priority system. If a track gets more votes it will move up the queue and play sooner. If you wish to clear all requests, click Clear All in the upper left.